Sit… Stay… Alright, now that I’ve gotten you in place, let’s talk about your furry little (or big) friend. I love, love, love dogs. Always have and always will. 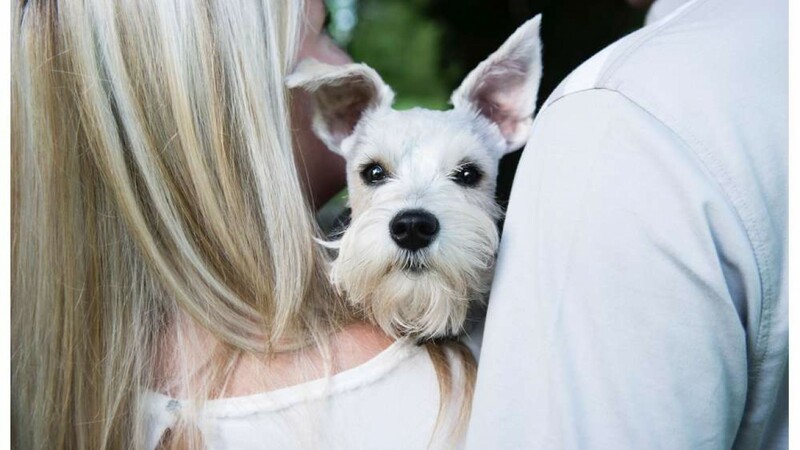 For many people, dogs are family members, so it makes sense to have them in the engagement photos. Like little kids, though, dogs don’t always behave. After some trial and error, I’ve figured out 9 Tips For Engagement Sessions with Your Dog. Most people love dogs but not everyone. It’s important to talk to everyone involved before getting too set on having your fur baby at the session. First, ask your fiancé. This session, just like your marriage, is about two people. You want both of you to be excited about everything. Two, ask your photographer. Some photographers might not be as pumped about dogs as I am. They might not have the experience with dogs, might be allergic, or just not like them. You don’t want to put your photographer in a bad situation. The location plays a big part in the engagement session, and it can be tricky finding the right place normally. When you add a dog into the mix, it makes things even more complicated. The first thing to consider is whether dogs are even allowed. The easiest thing to do is to call the location and ask. Most places will give you the Ok, but it’s better to ask beforehand. If you don’t, it might ruin your session. The other thing to consider is the actual location. Will it work well with your dog? Are there any things around that could be a distraction like people or other animals? Is there anything that could be dangerous like traffic or objects on the ground? I bet you’ll be doing your hair and makeup for your engagement session, so you also want to make sure your furry friend looks good. Depending on the type of dog, this could be something simple like a brushing or something more involved like a full grooming. I’m not a big fan of dressing up dogs on a normal basis, but your engagement session is a special occasion. You don’t want to go crazy and do something outrageous, but a little bow tie or some kind of item can add to the photo. The biggest thing is to make sure your dog can handle the outfit. The last thing you want is your dog to freak out or be upset. Try things out before the session and get your dog use to it or you’ll find out it’s not going to happen. Do you have a super hyper dog? I know I do. During the engagement session, you’re going to need your dog to stay with you and be calm. Things will be very difficult if he or she is going bonkers. To help with this, I suggest you try to wear your dog out beforehand. Go for a walk or run to get rid of some of that energy. It’s always nice to have a helper at any kind of session. With a dog, it’s a must. You’ll be walking and carrying things, so it will be hard to keep up with your dog. Bring someone along to help get the dog from one spot to the next and other things. The engagement session is mainly about you two. Don’t try to bring your dog for the entire session. It’s just too much. Plan to have your pup out there either at the beginning or end of the session. I’d plan for maybe 30 minutes of the session. For the rest of the time, your helper can be in charge of the dog, and you can focus on the session. My dog loves food, and he will do anything for food. I think this is true for most dogs. If you bring treats or toys, it will be much easier to get your dogs attention or control them. Again, this can be something for your helper. He or she can stand by the photographer with the treats or toys, and I guarantee the dog will follow. Do you want to look good in your engagement photos? Now that you’ve figured out your furry friend, what about you? Are you worried about how you will look in your photos? Any idea what to wear? Don’t worry, I’m here to help. Download my Engagement Clothing Guide and you’ll have one less thing to worry about.